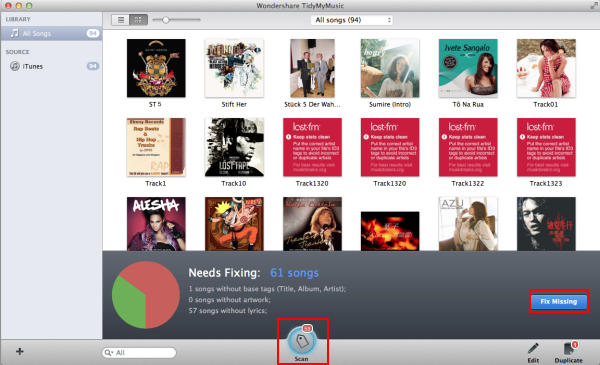 Wondershare TidyMyMusic is rated the best TuneUp alternative, TuneUp replacement and equivalent. As a similar software to TuneUp, TidyMyMusic provides almost all features that Tuneup offers like fixing mislabeled songs, finding and adding album art for your songs, deleting duplicate tracks. The TuneUp Alternative for Mac/PC is super fast and easy-to-use, and the results are always accurate powered by the sophisticated acoustic fingerprint technology. The TuneUp replacement can automatically fix missing and mislabeled music info. It’s that easy to say goodbye to labels like “unknown artist” and “Track 01”. 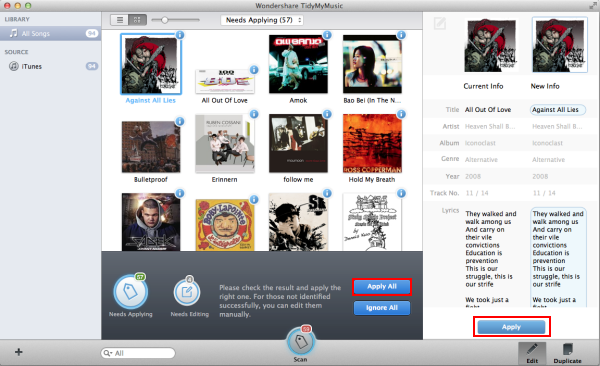 The TuneUp similar software can automatically find album artwork for iTunes music, download and add music tags like artist, album, song name, etc. It’s that easy to to complete music tags. The alternative to TuneUp allows you to manually edit music tags including artist, album, album cover, title, etc. to complete music files. 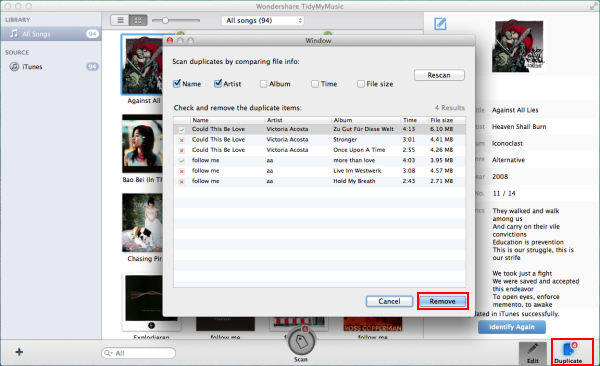 Automatically identifies duplicates songs with options to choose deleting or keeping. The retrieved information or ID3 tag, including track details, album arts and lyrics, is embedded to the MP3 file itself. So you can sync all the information with the MP3 file to other devices like your iPod, iPad, iPhone and much more. The TuneUp alternative is designed to clean up all your music including local folders and iTunes library. The TuneUp alternative for Windows supports all Windows systems including Windows 8, Windows 7, Windows XP, Windows Vista, and Windows 2000. The TuneUp alternative for Mac is fully compatible with Mac OS X 10.4(Tiger), 10.5(Leopard), 10.6(Snow Leopard), 10.7(OS X Lion), 10.8(OS X Mountain Lion), 10.9(OS X Mavericks) and 10.10(OS X Yosemite). 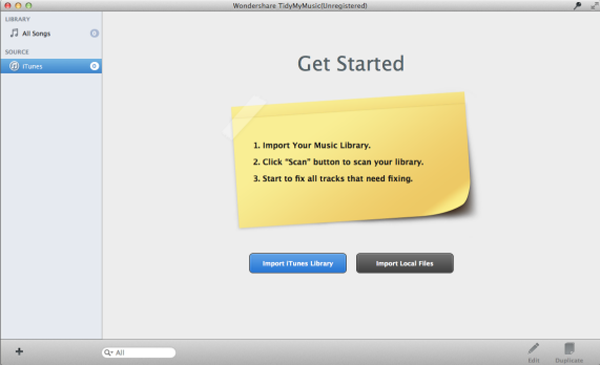 Free download Wondershare TidyMyMusic (for Windows, for Mac). Install and launch the program. Import your music library to the TuneUp alternative by clicking the button of “Import iTunes Library” or “Import Local Files”. Click the “Scan” button and a pop-up window will tell you how many songs need to be fixed. 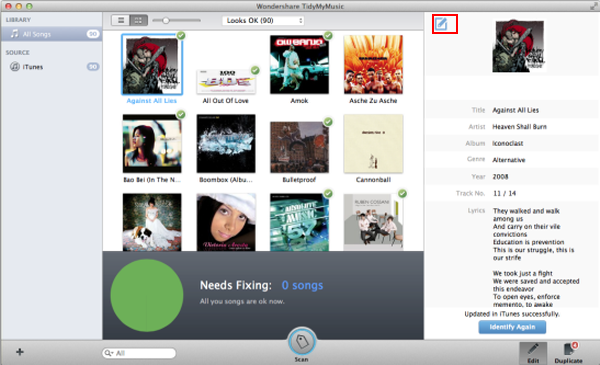 Click the “Fix Missing” button to start retrieving information for every track. During the process, duplicates will also be spotted. Once scanning is finished, Choose “Apply All” or “Apply” to add information to every song. You can also edit songs info as you like after applying the found information. Click the “Pencil” icon shown in the following picture and fill-in the editing field or drag any image to the album art area. If you decided to to remove duplicated songs, click on “Duplicate” on the bottom and press on “Remove” in the prompted window to remove duplicates with the TuneUp alternative.